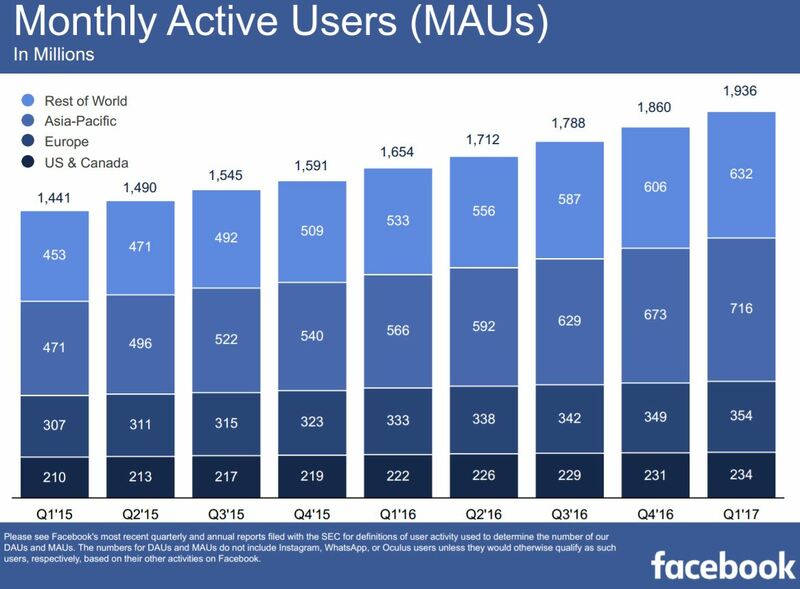 Facebook hasn’t quite reached the 2 billion monthly user mark yet, reporting during its first-quarter-2017 earnings call Wednesday that it now has 1.936 billion monthly users and 1.284 billion daily users. 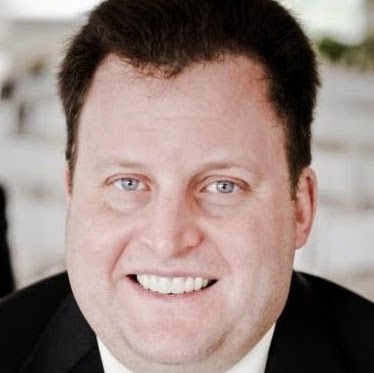 Unlike in past earnings reports, the social network no longer breaks out mobile and mobile-only monthly and daily users—perhaps a sign that it no longer feels the need to prove that it has established itself as a mobile company, as the mobile and mobile-only figures were only marginally less than the totals in its most recent quarterly results. 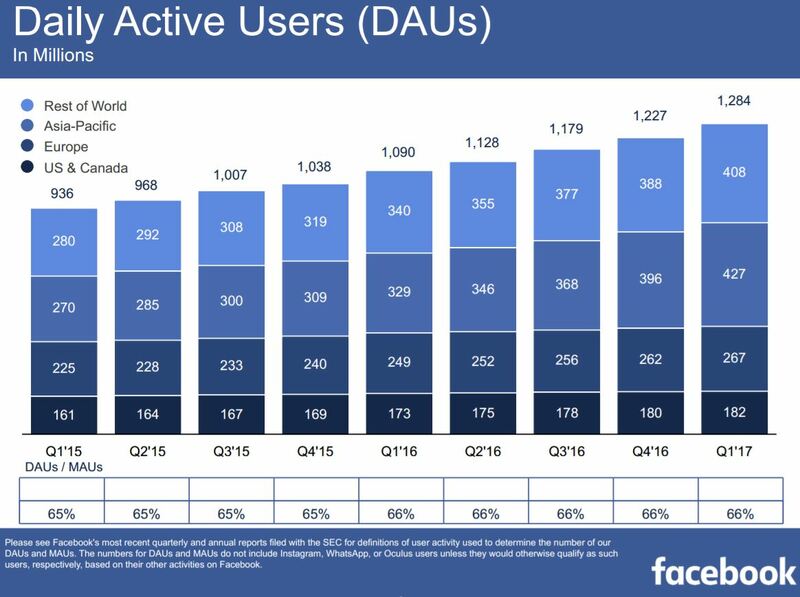 Facebook Messenger has more than 1.2 billion monthly users. Instagram Stories has more than 200 million daily users. 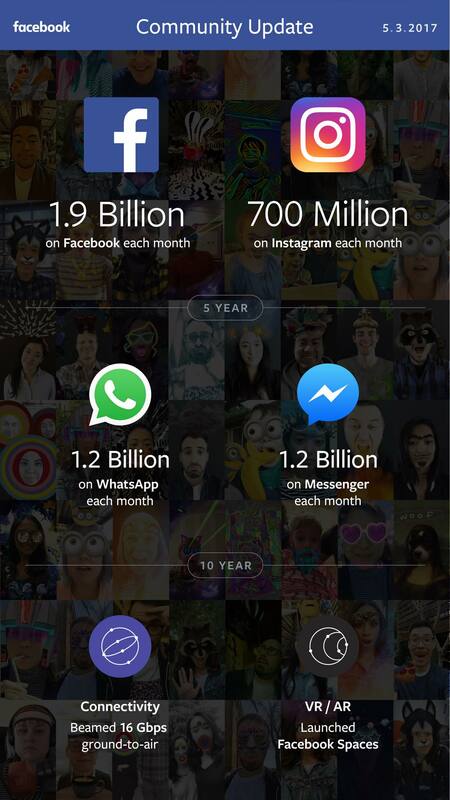 WhatsApp Status, which launched in late February, already has 175 million daily users. More than 70 million businesses are using pages on a monthly basis. More than 5 million businesses are actively advertising on Facebook, with more than 1 million of those from emerging markets. Instagram now boasts more than 1 million advertisers and over 8 million business profiles. More than 100 million Facebook users are part of what co-founder and CEO Mark Zuckerberg called “very meaningful” groups. Building a global community that works for everyone starts with building millions of smaller supportive communities. This is especially important, since membership in many physical communities is declining. We recently found that more than 100 million people on Facebook are members of what we call very meaningful groups, like parenting or rare diseases—support groups that are an important part of their support structure. My hope is to help more than 1 billion people join meaningful groups to strengthen our social fabric over the next few years.